Leonard Boden was a Scot born in May 1911, who died in 1999. He came to Malsis in 1919 before moving on at 13 to Sedbergh School. He had two brothers who went into the family business Rowan and Boden, a ship furnishing company. He went to the Glasgow School of Art where among his tutors were the portrait artists William Hutchison, Francis Hodge, John Revel and Frederic Whiting. After his marriage in 1937, he and his wife both studied at Heatherley School of Fine Art in London and worked together in illustrating books in the 1930's. Their daughter Daphne, a harpist, became a professor of harp at the Royal College of Music and the Royal Academy of Music. Among the honours that Boden received were a gold medal at the Paris Salon, being made a Freeman of the City of London and a liveryman of the Worshipful Company of Painter-Stainers. He chaired the Chelsea Arts Club in the sixties and was a Vice President of the Artists' General Benevolent Institution. 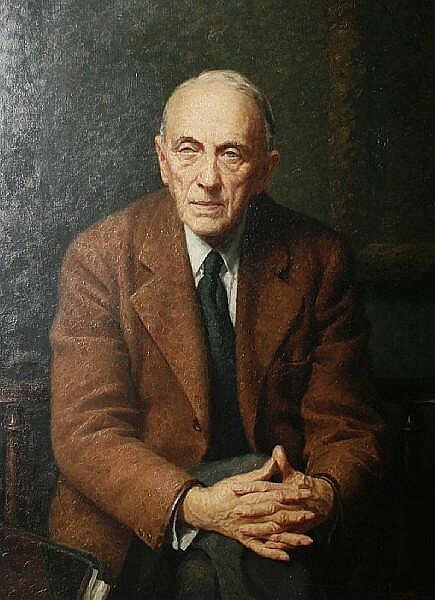 He served in intelligence in the 2nd World War, after which he began to paint portraits professionally, gaining a reputation for his depictions of actors such as Alastair Sim and Donald Wolfit. A portrait of Field Marshal Lord Milne was his first large scale commission in 1954. Later portraits of dignitaries included Lord Mayors of London, George Pinker and Margaret Thatcher. He painted the only portrait of Pope Pius XII in 1957 which was later hung in the Vatican, nineteen portraits of the British Royal Family, including ten of Queen Elizabeth 11 and five of the Duke of Edinburgh. His first portrait of the Queen hangs alongside a portrait of Prince Philip at the Royal Military Academy, Sandhurst. Four of his portraits of the Queen were painted for government institutions in Canada. The Queen often recommended Boden if asked whether she would prefer any particular artist's depictions of her and enjoyed Daphne's harp playing ( she sometimes played for the Queen while her father painted.